Opening with its first load of corn in April 2004 in rural West Burlington, Iowa, Big River Resources was in a good place as it rode on the wave of an Ethanol boom partially due to the war on Iraq, and partially on the Bush economics and the public support after 911. Everyone seemed to be on board to rid Americans of their dependence on foreign oil. But like all businesses, when the waters turn rough, and turbulence comes, you have to have more than luck on your side. You need wisdom and foresight of many, working tirelessly, to find ways of making things work. At Big River Resources, the light was burning late and regularly at West Burlington, offices because those investors who believed in them were their neighbors and their friends. The board held long Risk Management meetings each week, keeping on top of every situation and problem, and every opportunity, moving quickly to not only keep BRR operating smoothly, but to keep her growing to add value whenever they could. 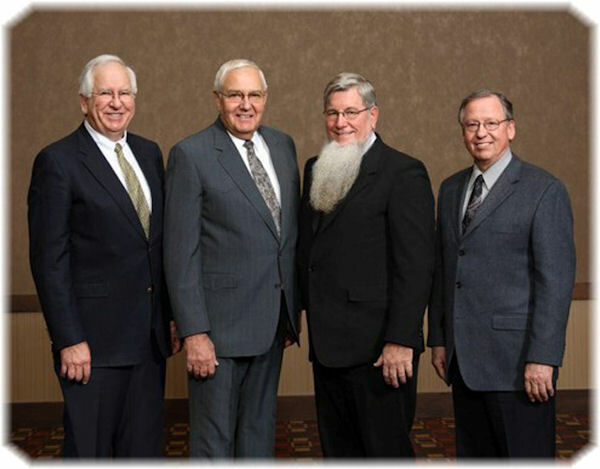 What these men have done, with the blessing of the good Lord, is extremely commendable in this industry, as many in the ethanol business have failed or gone bankrupt for different reasons, including giants in the industry like VeraSun Energy. Yet, at the 7th annual meeting of Big River Resources Thursday at the Pzazz complex, investors were calm and assured as they heard good news of their company and its success story continues. Investors were pleased to hear they will be receiving another dividend check in March. Cooperative investors will each be receiving $600 per share and Big River Resources L.L.C. investors will be receiving a slightly lesser amount per share due to what Defenbaugh explains as an L.L.C. stock split. This is in keeping with their desire to return 40% of the profits back to the shareholders, said B.R.R. C.E.O., Raymond Defenbaugh. One investor asked if they could receive more dividends and Defenbaugh explained that they could, "but we don't want to have to call you up and ask for it back like one company did after corn prices went higher than they had predicted and they hadn't adequately prepared." Defenbaugh said that there are advantages they receive by having a certain financial leverage. General Manager Jim Leiting explained how there can be three different trains leaving plants at the same time with $6 million of unpaid ethanol on each one until it arrives to its destination. That is $18 million and people still want paid and we need to have the capital to keep the plants operating while we are waiting for those payments. After Big River Resources opened in 2004 in West Burlington, Iowa, they followed with a $64.5 million expansion project which added 23 jobs to the 40 workers at the plant. 105 million gallons of ethanol and increased the production of dried distillers grain from 167,000 to 257,000 tons. The expansion also increased the amount of corn it uses from 19 million bushels to nearly 29 million bushels. Later that year (October 5, 2007), Big River Resources West Burlington, LLC received the Manufacturer of the Year award by the Burlington/West Burlington Chamber of Commerce and its economic development division, Grow Greater Burlington. But that is not the end, through the year of the great flood of 2008, dividends kept coming and the plant continued to grow and work through a closed bridge, closed roads and farmers losses, yet ending the year with profits. Monmouth Grain & Dryer with facilities at Monmouth and Gerlaw Lincoln Rail in Galva and constructed a new Ethanol/DDGS facility Big River Resources Galva, LLC. which opened in June 2009.
controlling interest in the new Fagen-IMC Ethanol plant in Dyersville, IA now Big River United Energy which has now been in operation for 5 1/2 months. These two facilities added 230 million gallons bringing all facilities to a total production of 335 million gallons and over 1/2 billion dollars a year in gross revenue. While adding value to the company, BRR also were creating jobs with a total workforce of 187 employees today. 2009, was another successful year. Everyone said the industry was doomed, but Big River was able to escape the adversity that many in the industry experienced in '09. Many were not prepared to withstand the trauma economically caused by highly volatile ethanol and corn prices and decreased margins. Not only did Big River withstand the storms, but continued throughout the year to grow and pay good dividends. Investors heard General Manager Jim Leiting tell his predictions for 2010. After 2009's busy year of building a 575,000 grain storage bin in Gerlaw, putting the Galva plant into operation May 19th, putting together the Big River United Energy Joint Venture in August - acquiring the Dyersville Ethanol plant in September they ending their fiscal year with a record ethanol production of 101,807,497 gallons. Those are some of the rewards investors have for trusting in Big River Resources and their solid risk management, team besides bringing value back to their communities. Raymond Defenbaugh, Les Allen, Gene Youngquist, Jim Gunter, Steve Gietz. Terry Davis, Mike Rumbold, Larry Lagowski, John Hare, Dean Hennenfent and Jim Burlee of Illinois; and Andy Brader, Larry Unkrich, Gordon Ommen, Kirk Siegle, Dave Reinhart, Pat Edmonds, Steve Mallams, Chris Schwarck, Dr.
John Dooley of Iowa, and Zafar Rizvi of Ohio. Raymond Defenbaugh, Les Allen, Gene Youngquist, Gary Sandberg, Jim Gunter, Steve Gietz, Terry Davis of Illinois, and Larry Unkrich, Kirk Siegle, Pat Edmonds, Steve Mallams, and Andy Brader of Iowa. Big River Resources, L.L.C. officers from left: Gene Youngquist, Secretary; Andy Brader, Vice Pres. ; Raymond E. Defenbaugh, President/CEO/Chairman; Les Allen, Treasurer.